The author and artist of this deck also has made an I-Ching deck for the original publisher, Urania Verlag. Urania Verlag seems to be a sister subsidiary of AG Mueller, which recently published an English language version of the Ananda Tarot in 2004. I had seen a beautiful review of the German language version and actually traded for this title. This was a pretty collage deck that I soon also traded away, as the book in German was not useful to me and the art was simply appealing without too much relevance to me. After a while, I read fan chat about the English version and went on-line to search for more images. For a birthday present, I decided that this pretty, soothing deck might be a good choice. I was surprised that the English language book seemed much thicker than I remembered in German. I realize now that I am someone who needs the words to create context for me. My limits are a need for structure to inspire my mental film-play to activate, click and begin to roll. Because the context of different tarots do activate different reactions in me. If you tell me a deck has Thoth-based images or Italian historical origins, I have different approaches to these decks. Photography and collage art forms are modern to me. Right now they are not immediately familiar or intuitive. I think because these are part of my current expressive outlets, it engages analysis, but not always appreciation. The book was a pleasant surprise and unlocked and opened up the deck images to me. I have some other AG Mueller titles that cross the cultural influences of Buddhism and Westernized Christian and Tarot concepts, some with slight nods to Crowley Thoth images or are strong variations of the Thoth (Via Tarot). However unlike the Via Tarot, I did not have the reaction that this was a private study deck -- I had the reaction this was a very readable, peaceable deck that would hint and guide the reader and querent, suggest and allow for more meditative thought. One thing that I find more important in tarot decks is how I see the court cards. I found each court card to be visually pleasing. If I choose to read for someone and used a court card from Ananda to symbolize them, I do not think they would be displeased. I did notice the eyes and eyebrows of the Knight and Queen of Swords seem to be the same image, but there's enough variation in the images to suggest a brother-sister relationship. Some of the faces are obviously repeated in the cards, which did not appeal to me initially when I was studying the pictures alone. I did not have supplemental text to suggest a difference or alternative view. I've not been pleased with many repeating motifs since I saw the One World Tarot. The text of the book for the One World Tarot was interesting, but could not overcome my distaste for the images. How is the text of the Ananda Tarot different? The write-up includes description of the Image, Meaning, Astrological Significance, Keyword and Traditional Meaning. Every picture has a black and white image and description under each of these categories. From page 20 to 276, there's about 250 pages to assist you for these cards. And it's a nice pocket-size paperback. The text includes about 18 pages of suggested layouts and 11 pages of introduction to the concepts of this tarot and general tarot background. A very nice table of contents is also added and a brief artist/author biography. The website link for the author/artist does not work for me. Three haunting and dreamlike majors of the cards include, XXI The Universe, XII Reverse (Hanged Man) and XIII Death, which look like romantic images from old Master paintings to me with a touch of the surrealistic. Something new and startling to me is looking at the cards in reverse. The filmy delicacy of an image such as Justice upside down becomes a transparent reflection in a distant, dim mirror. Many of the Spheres cards as the Two of Spheres have reversed images in them. I find if I turn the card upside down, then that smaller reflection takes on a new meaning to me. The card symbolism now suggests being diminished. I believe the Tarot of Paris by J. Phillip Thomas and the Hudes Tarot book introduced these concepts of reversals. A reversal can be treated as diminished aspect or showing a need/lack of the card energy and association. In some of the 'negative cards' there may be a pleasant surprise when you reverse the card. 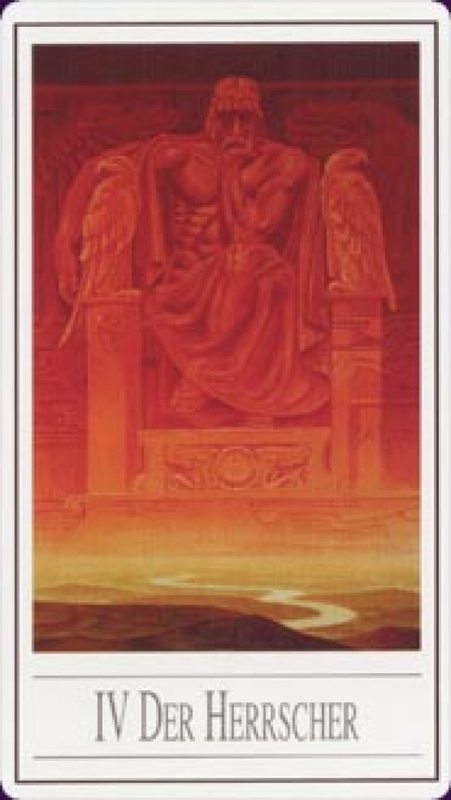 Some landscape elements such as the Nine of Flames reversed showing a daybreak melting down into a darker background...an interesting and more positive association to this reversal. This is my first weekend with the English-language Ananda and I'm already thinking of obtaining a duplicate copy, to make annotations and in case this new one becomes beat up with much love and use. I'm not certain if this delight will last, but I think at least this tarot will stay in my collection for quite a while.